BHP Bucket Elevators are designed to handle all types of critical applications of the process industries. BHP Bucket Elevators equipment combine the most advanced design with optimum selection of components and world class manufacturing techniques to meet all application and capacity requirements. The complete line of bucket elevators include large capacity centrifugal discharge elevators, continuous discharge slow speed elevators and combined discharge RP design bucket elevators and industrial duty elevators for light duty applications. This range of elevators can meet any application requirement. The high capacity centrifugal discharge BHP bucket elevators are built specifically for severe service and round the clock operation requirements for process industries like cement, for handling materials up to 50 mm lump size. Whenever there is a requirement for elevating large lump bulk material or high volumes of friable materials at slow speeds, BHP continuous discharge bucket elevator with twin strand chains is offered. For elevating materials with the large variation in particle size from fines to 75 -100 mm lumps, we provide combined discharge RP bucket elevators. For medium duty applications, a wide range of industrial duty bucket elevators are available. 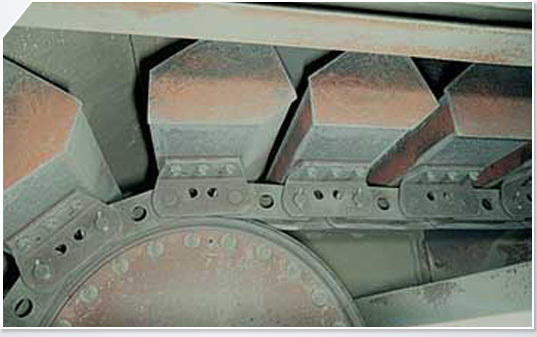 BHP bucket elevators are available both with Chain and Belt designs. Inherent characteristics of the material being elevated and the application requirements determine which type of bucket elevator is best suited for the application. BHP has supplied chain bucket elevator with lifts in excess of 75 meters and belt bucket elevators with lifts in excess of 105 meters. Capacities up to 1500 metric tones per hour are feasible. BHP has supplied more than 600 bucket elevators in India and other countries for a variety of applications and industries.